Now that we've talked about the layout of the task, we an start talking about math. This is great! So I realized that there are gonna be a few people who are taking the GRE, maybe people going into physics or engineering, something like that. That are excited about math, maybe even as excited as I am. And I realize that most people are not quite so excited about math. That's perfectly fine. 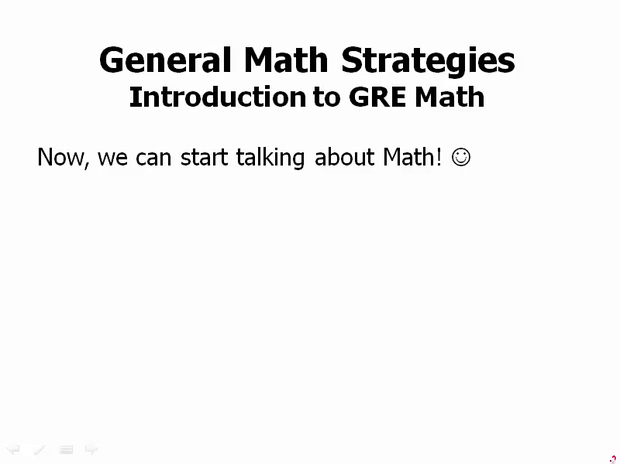 We're gonna lead you step by step through all the math you need for the GRE. Don't worry. In this module we're just going to be talking about overarching strategies related to the basic act of calculation, so doing the basic arithmetic. And this is something that will play out in many, many problems across the Quant section. If frequent use of the calculator is a big part of the GRE Quant plan, your big, your, your plan for the GRE Quant section, you are going to fall right into their trap. There's many people, that's just the way they think, they practice every math problem with a calculator right there. They're always touching the calculator and they figure well, I'm going to have a calculator on the GRE, so I might as well just use the calculator as much as possible. Big, big mistake. I'm going to advise that you try in all your practice not to use a calculator. Make it your goal to do all your math with no calculator. And then maybe one out of every 20 problems, one out of every 30 problems, you have to reach for the calculator. Imagine, for example, that you had to pay a $20 tax every time you touch your calculator. That's not very impressive. The GRE is not interested in testing that skill. Instead, the GRE is interested in testing your mathematical logic and number sense. That's what's important on the GRE Quant Section right there, mathematical logic and number sense. Many GRE problems appear to require a detailed calculation, but when you use your logic, you realize that a very simple, elegant solution is possible. That, in many ways, is the secret of the GRE Quant section right there. That the long, detailed calculations are not necessary. There's often something very elegant, and really, the test is, can you figure out that elegant solution? It's very important, though, to be comfortable with basic mental math, cuz basic mental math is gonna show up all the time. Especially, you know, simple, you know, one-digit number times one-digit number or two-digit number divided by one-digit number. That kind of thing, you need to be able to do that without touching a calculator. In fact, I would say if you have a friend or a partner or someone who can test you, have them hold the calculator. They'll type, they'll give you the calculation. They'll type it into the calculator. And then you'll have to come up with it on your own, and they'll be holding the calculator to verify your answer. That's an excellent way to practice. Also, I'll say do math every day in your head. Calculate tips. Sum your grocery order as you shop. You can sum your order, say, to the nearest dime as you're shopping. Estimate the gas mileage of your car. Look around various rooms that you're in. What's the approximate square foot area of the floor or the walls? How much paint would it take to paint the walls? What's the distance from one point to another? Practice estimation. Practice using math as much as possible in real-world situations every day. Then the more you can think about math, the more you can see your math, see math everywhere. And I guarantee you, there is math everywhere. Then the more comfortable you'll become with it. In addition to the basic mental math you learned in school, we will discuss in this module, a few mental strategies that will help you on the test. The more you work, or even play with math in your head, the more you will see patterns and develop number sense. Now, you realize right now, if math has never been your favorite thing, the idea of playing with math, that might seem completely foreign. That might seem like cuddling with an octopus or something like that. We're gonna talk about this more in this module. Don't worry.